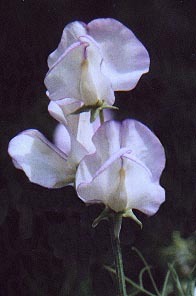 Although a Sweet pea flower looks like a tender heart, it is a tough vine. Home is where the Sweet pea garden grows. Although a Sweet pea flower looks like a tender heart, it is a tough vine. Once the seed sprouts, it takes off like a rocket, shooting out tendrils to grasp anything in sight. When the tendril barely touches a string, it quickly wraps itself around the object. Then the plant shoots up in height, and the next tendril seeks something to grasp and hold on tight. In very little time the vine shoots up to six feet or taller, ready to blossom into wonderful, sweet-scented flowers. There are so many sweet peas to choose from and new cultivars being bred each year. My quest is to try to grow every single one of them. I calculate if I grow a minimum of ten varieties of Sweet peas each year, I could spend the rest of my life tending sweet peas and not repeat growing the same variety. Not a bad thought, tending Sweet pea vines for the rest of my life. I can see myself gathering armfuls of Sweet pea flowers, to bring fragrance and delicate beauty inside my home. I can gather every few days, keeping the vases filled with fresh, fragrant flowers. The Plant Gallery and Growing Guide has a growing list of Sweet peas I have grown. Instead of buying the standard Sweet pea mix, you might want to grow individual named varieties in your garden. Many of these cultivars are award-winning varieties that were bred for long stems with four to five flowers per stem. After growing these, you may never settle for just any mix of Sweet pea seeds again.